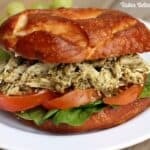 Shredded chicken salad mixture with homemade pesto, served with mozzarella, tomato, and spinach on a crispy roll. I just can’t get enough of fresh basil during the summer time! 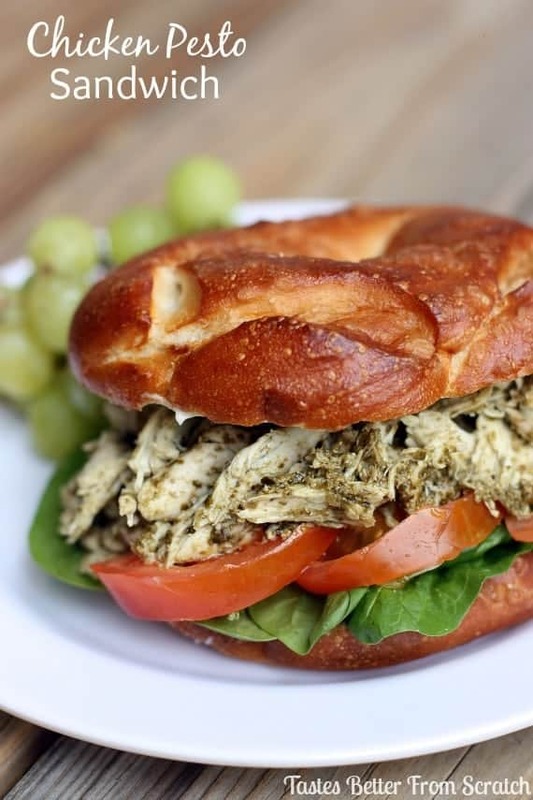 There are too many yummy things you can make with it–like this pasta salad, or fresh pesto for this Pesto Chicken Sandwich or a million other yummy dishes! I like to make a large batch of pesto and keep it in the fridge or freezer so I always have some on hand! 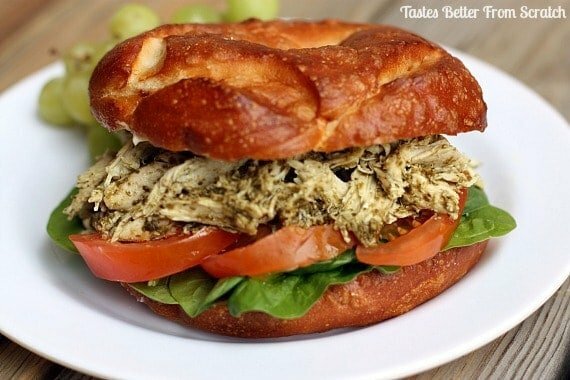 This sandwich is great for lunch or dinner time. It’s super filling and you can serve it with a side of fruit, fresh baked fries, potato salad etc. Combine basil and pine nuts in a food processor and pulse until coarsely chopped. With the blade running, add the oil in a long, smooth stream and process until smooth. Season with salt and pepper and stir in the parmesan cheese. In a large bowl, combine the chicken, yogurt, 1/3 cup pesto, and salt and pepper, to taste. Layer mixture on your toasted rolls, along with spinach, tomato, and fresh mozzarella. The chicken pesto sandwich at Zupas is my favorite and this sounds like a great at home alternative! Thanks! Yumm, I haven’t tried Zupa’s version–i do that next time I’m there! Hope you get to try this one! I’m with you – basil and summer just go together! This looks super yummy! Pinned! I know right? And I love growing my own–it’s so much cheaper than getting it at the store! My mouth is seriously watering! Just pinned for later! Thanks Jessica! Hope you like it!! I pinned this as fast as I could it looks sooooo good. I love pesto! What a delicious looking sandwich!!! I’ve been pesto obsessed lately… it just makes everything extra tasty!!!! I agree–you can put it on so many things and it makes them so much yummier! Thanks Maria! This looks absolutely divine, Lauren! Delish! Thanks Kristi, it’s so simple, but delicious!